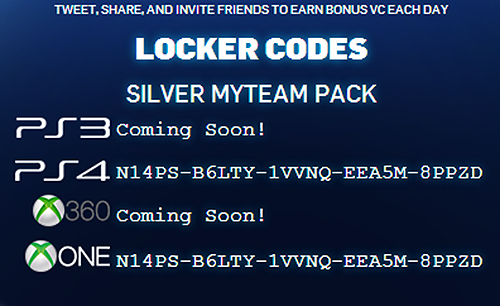 Enter this locker code to unlock a silver pack in NBA 2K14's MyTeam! It could be Ray Allen, Vince Carter, Nate Robinson, or any players who are of the silver tier. Try it now and be sure to share it with your friends. Xbox 360 and PS3: Coming Soon! With new locker codes every week, be sure to come back and receive free VC and other stuff in NBA 2K14. More NBA 2K14 locker codes.